I used to work with a fan of Tangerine Dream's early works from the '60s and '70s. Apparently, during his lunch-breaks and without any obvious hint of drug intake, he would scurry home to listen to 'the Dream' (or similar such acts - he had a penchant for Cluster as well). Nothing too weird about that, you might say, but this practice extended beyond the realms of mere listening whilst building a ham and cheese sandwich. He'd put slide-shows, disco-lights and lava lamps on, slump back into his armchair and close his eyes - before returning to work, fully-meditated and as fresh as a daisy. Legend. In fact, oddly enough, he hated Tangerine Dream's contribution to the film of the same name, but that's another story. If he sees this article on the internet and assuming that he isn't still 'floating in space', he'll be salivating at this. 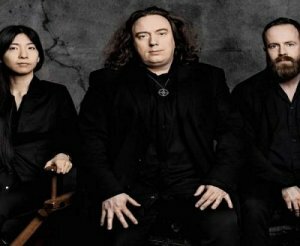 Tangerine Dream have announced a rare UK show for the summer, as part of their Electric Mandarine Tour around Europe. Shepherd's Bush Empire will host this one-off appearance on 24th June, giving fans of the iconic electronic legends a chance to hear new material from their upcoming albums (that's a deliberate plural, by the way), as well as older instrumental material drawn from their (cough) 200+ releases. Tickets will go on sale from Friday 3rd March, priced at £45. Their new releases include an EP entitled 'Machu Picchu' and two albums, 'Booster V' and 'Finnegan's Wake', a homage to Irish literary figurehead James Joyce. These are the latest in a very long line of albums, the first of which was issued as far back as 1967 in the form of 'Electronic Meditation'. Subsequent albums gradually veered away from the free-prog electronic of the early years, particularly after a few releases on Virgin including 'Tangram' and 'White Eagle'. During the '80s they soundtracked several films, including that 'Legend' movie, plus 'Near Dark' and 'Miracle Mile', while later music has become a far more transient affair with ambient and new-age influences. Tickets for this show are sure to sell through very quickly, regardless. Thu 9th May 2019 Philip GlassRoyal Festival Hall (Lambeth)More Info..